In the weeks before Christmas, my Tumblr dashboard and Pinterest feed were flooded by images of people hand-making gorgeous, rustic and earthy holiday wreaths. They made it look so easy, gracefully tying together carefully foraged branches and casually slinging the final product over their shoulders while moodily looking off into the distance. Well, I optimistically thought to myself as I scrolled through image after image of beautiful people holding even more beautiful wreaths. That could be me! Indeed, it seemed like the wreath gods had smiled upon me: a particularly windy day had left many perfectly rustic branches from my neighbor’s bamboo farm strewn across my front yard. I unceremoniously gathered and stuffed them in a leftover Amazon box carefully hand foraged them and gave my craftiest friend a call and told her to bring over some floral wire. 40 minutes and one full cycle of 1989 later, I gave a roar of frustration. My hands were full of splinters and covered in tiny pricks from the pine needles. My dining table was covered in sticky sap from the branches. And worst of all, my wreath was beyond FUGLY. More circular in theory than in practice, it also appeared to have… antlers??? The metal floral wire that was holding the wreath together was very visible, as well as potentially deadly — picking up the wreath resulted in a host of new splinters and cuts in my hands. So much for throwing it over my shoulder. And just like that, there went my dreams of having a Pinterest worthy holiday wreath. The best my wreath could do was ceremoniously crown the paper mache wildebeest in my dining room; there was no way I was hanging that ugly thing on the door for the public to see. As gorgeous and decorative as a holiday wreath, but with the added bonus of being able to EAT it. So take that! all you hipsters with your beautiful wreaths and your beautiful lighting. I’ll take my edible wreath anyday. 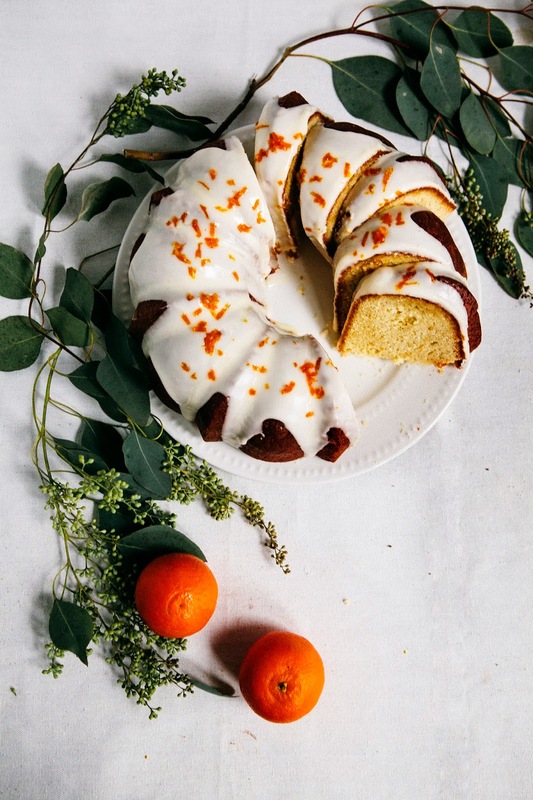 In this particular case, this is a classic sour cream pound cake with a seasonal twist: tangerines. I’ve infused the sugar in the cake with generous amounts of tangerine zest, as well as made a cake soak from tangerine juice. It’s dense but manages to remain oh-so-moist and fluffy from the generous amounts of butter, sour cream and tangerine juice in the recipe. Feel free to substitute tangerines with any winter citrus you might find! Traditionally, classic pound cake contains a pound of its four main ingredients: flour, butter, eggs and sugar. Although this recipe doesn't quite follow that ratio, it comes pretty close, meaning that it can end up too heavy and brick-like (because of all those ingredients!) if the cake isn't creamed properly. It's pretty important that you follow the recipe's instructions and cream the sugar and butter together on high speed for a minimum of 5 minutes, preferably the full 7 minutes. Creaming is the process of creating air bubbles in the cake batter, and those air bubbles are what makes cake light and fluffy in the end. If you don't cream this recipe well and then proceed to add the soak to the cake, you'll end up with a sad, heavy cake. Just be careful not to overmix it when you start adding the flour in — overbeating after the flour's been added results in the overdevelopment of gluten, which will make your cake heavy, tough and terrible. Center a rack in the oven and preheat to 325 (F). Prepare a 10-inch bundt cake pan or tube pan by generously spraying with cooking spray and lightly coating with flour; set aside. In a medium bowl, whisk together 3 cups all-purpose flour, 1/2 teaspoon baking soda and 1/2 teaspoon kosher salt until well combined. Set aside. In the bowl of a freestanding electric mixer fitted with a paddle attachment, combine 3 cups granulated sugar and the zest from 3 freshly grated tangerines. Use your fingers to rub the zest into the sugar; doing so will release tangerine oil from the zest that will infuse the sugar more powerfully. Once the zest is fully incorporated throughout the sugar, add 1 cup unsalted butter to the sugar and beat on medium-high speed until light and fluffy, at least 7 minutes. Once the mixture is light and fluffy, reduce the mixer speed to its lowest setting and add 6 eggs, one at a time, using a rubber spatula to scrape the sides of each bowl after each addition. Only add the next egg when the previous one has been incorporated. Once the eggs have all been added, scrape down the sides of the bowl one last time and turn the mixer back to its lowest speed. Add the dry ingredients (from the 2nd step) 1 cup at a time, mixing for 30 seconds after each addition. Scrape down the sides of the bowl, and add 1 cup sour cream and 1 teaspoon vanilla extract, mixing until the batter is smooth. Be careful not to overmix — it's always best to continue mixing until there are one or two flour streaks left, and finishing the rest by hand with a rubber spatula. Transfer the batter to the prepared cake pan, using an offset spatula to spread it evenly across the pan. Bake in the preheated oven for 1 hour and 15 minutes, or until a skewer inserted in the center of the cake comes out clean and the top of the cake bounces back when lightly touched. Cool the cake in its pan on a wire rack for 25 minutes, before inverting the cake on to the wire rack. Soak the cake while it is still warm. Place a baking sheet underneath the wire rack holding the cake to capture any drippings. Use a wooden skewer to poke holes evenly throughout the cake. In a liquid measuring cup, whisk together 1/4 cup fresh tangerine juice, 2 tablespoons fresh lemon juice and 1/4 cup granulated sugar until the sugar is fully dissolved. Pour slowly and evenly across the cake, using an offset spatula or a pastry brush to ease the liquid into the holes across the cake. Allow the cake to cool completely to room temperature before glazing with the icing. In a medium bowl, whisk together 2 cups sifted confectioner's sugar and 1/4 cup tangerine juice until it achieves a paste-like consistency. Immediately pour the glaze over the top of the cake, so it drips down the sides. Leave the cake uncovered until the glaze sets, about 20 minutes. Edible wreaths forever!!! This pound cake sounds incredible -- I can just imagine how moist the sour cream helps it to be. So beautiful, Michelle! Wow this is such a great holiday treat. Maybe I will try to attempt something like this next year. Always so impressed at how beautiful your creations turn out! 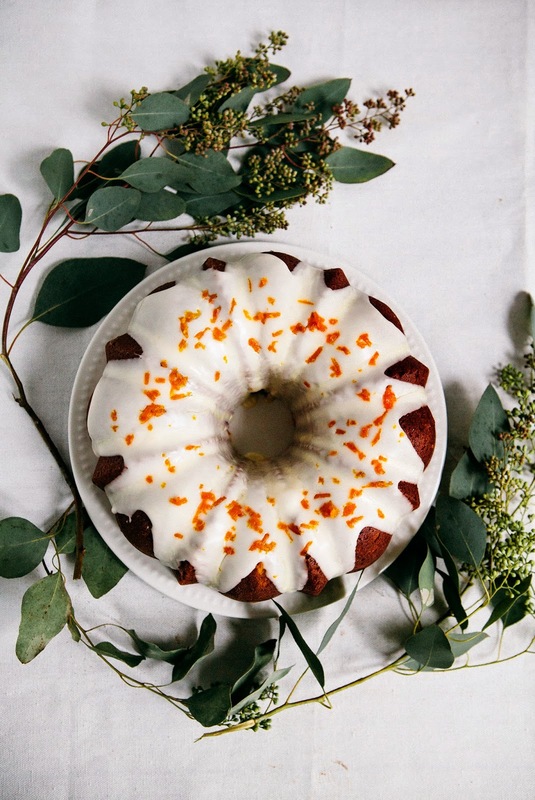 "bundt cakes are basically the wreaths of the cake world" hahaha yes they are! Beautiful cake and I love the colour of the centre! Ahaha I love your writing, as always! So hilariously honest ("roar of frustration" <-- I know that sound well. Also 1989!!!!!!!!!!) So approve of your updated form of wreath-making--this looks SO delicious. Putting this in contention for my roommate's upcoming birthday cake!! Can't agry more)) Wreath that can be eaten is thousand times better. Plus easier to make)! Thanks Cynthia! I love baked goods with sour cream in them; it definitely gives them an extra layer of moisture that's hard to replicate from just plain old milk. Thanks Rae! It was a little bit late for the holiday season, but there's always an excuse for cake, right?! Glad you agree! I'm just kicking myself for not thinking of that sooner. Thanks for the kind words! Hahha, agreed! Turns out that I am not as crafty with other materials — sticking to flour, sugar, butter and eggs from now on. Thanks for stopping by, Maryna! 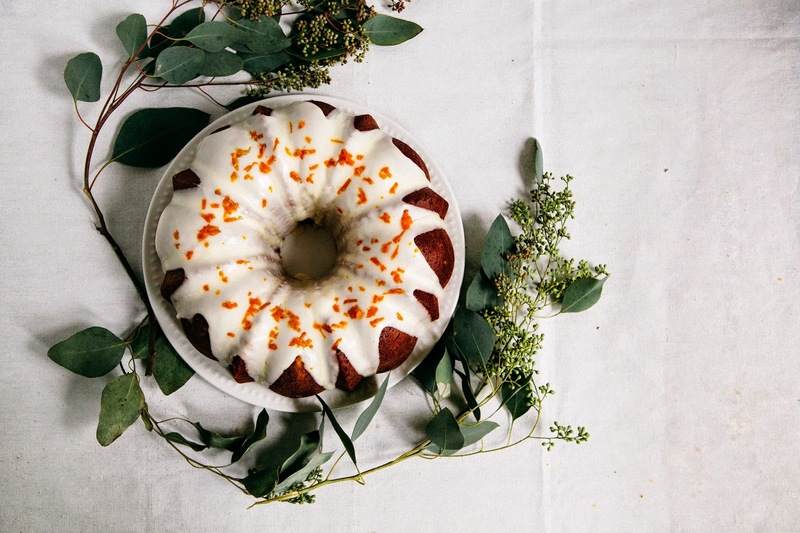 Bundt cakes ARE the wreaths of the cake world. Perfect. Also, I totally bought my holiday wreath from New Seasons and it rained weird little red berries all over my floor, daily. Oh my god. This look so amazingly fluffy and wonderful. I want to make this for my office next week. I will. This looks amazing Michelle!! How gorgeous and the flavours sound irresistible! hahaha, I love this post because I too gazed upon photo after photo of "foraged", "handmade" wreathes, wishing that I had the skills (and trees) to pull it off...NOPE. 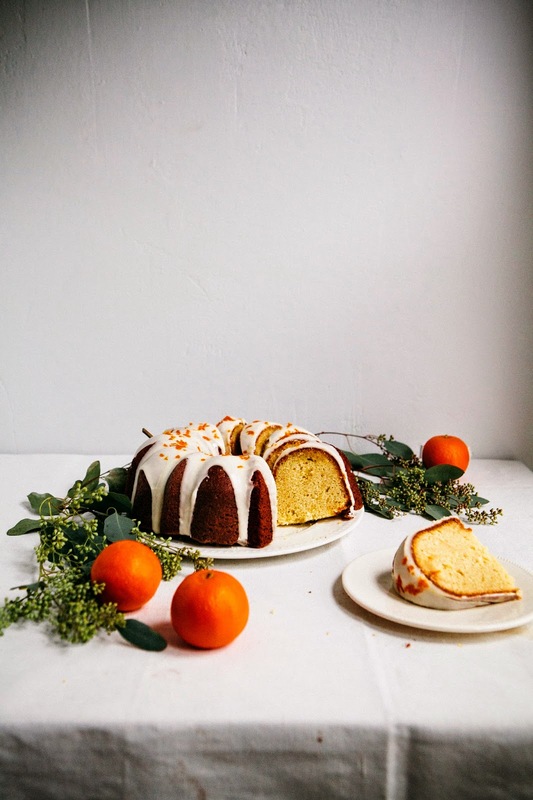 I'll take tangerine-kissed pound cake any day! 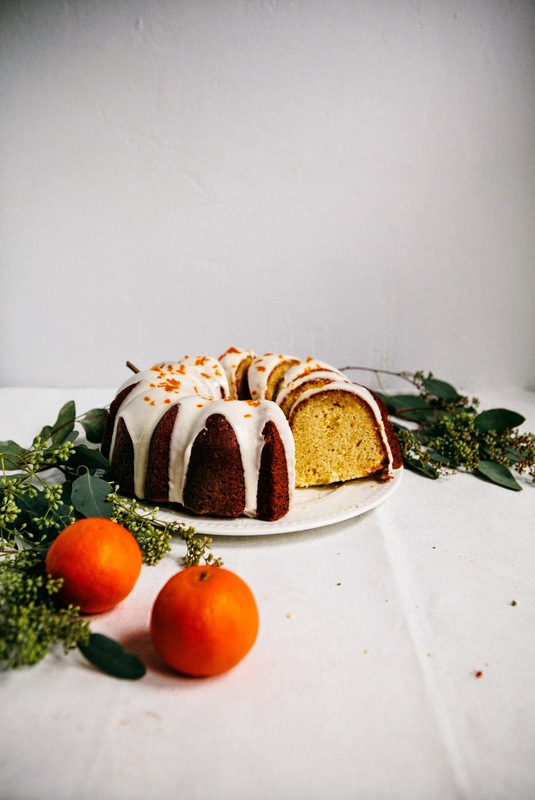 Tangerine pound cake is SO MUCH GREATER than a wreath. This baby wins, hands down, errytime so in your face, Pinterest! Also, the soak & icing combo, is a delight. OMG, that's hilarious. I've always been tempted by their wreaths (and literally everything else they sell in their floral department), but they are so expensive!!! OMG, so glad I'm not the only one. Also, wreath making is seriously much harder than it looks. Still super bitter about that. This is why I can not do PInterest crafts... I also fail horribly. All of mine will have the tag line "Nailed it "
Gorgeous! I'm craving the flavor of tangerines! I always forget about my buddy pan... So true about the "edible wreath". Imagine if people hung bundt cakes on their doors, it would be heaven! 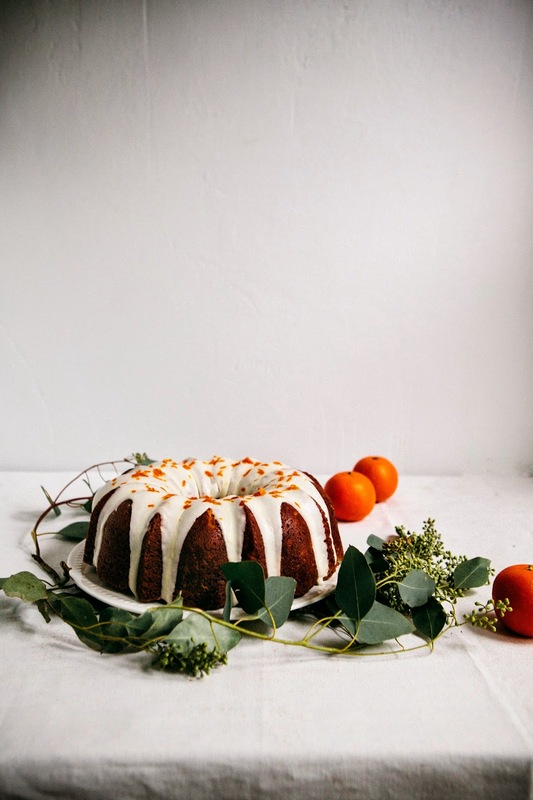 I always forget about my bundt pan too and am always happy when I rediscover it — no need to go through the trouble to frost the cake, it looks beautiful with a pour-over glaze. Or even on its own! Ooh, the floral tape is a good tip. Thanks for sharing! Also my friend and I tried to find swags, but it seemed like the entire city of Portland had sold out of them. Too many hipsters with the same idea, lolz. YES. Though I think then the city might be overrun with birds and rodents and everything will turn out like they did in that one Alfred Hitchcock movie... wait. Too grim? Thanks Kathryn!! Also, IKR. I should have made the cake much earlier, who was I kidding, really!? Looks awesome dude. Also, holiday wreaths are totally overrated, cake was obvi a much better option. Bravo!!! Sour cream cakes have such a lovely aroma and amazing texture. You had me at sour cream cake, well done! beautiful pictures as well. Sweet baby jesus. This looks so fresh and delicious! Is this recipe adapted for high altitude? If so, I look forward to trying. Hello! The cake looks amazing! Do you think I can substitude sour cream with greek yogurt?? Unfortunately, this recipe is for sea-level. You would need a lot of 6-inch cake pans — possibly 4 or 5 deep pans (at least 3 inches), since this recipe has quite a bit of batter, and reduce the time in the oven by about 10 minutes or so. Yes, you most definitely can! Be sure to use full fat greek yogurt though — I'm not sure low-fat/no-fat will yield the same texture. The cake makes a beautiful wreath, Michelle. I love all the greenery in your photographs too - they're just lovely. There is another option to the bain marie for cheesecakes. Low and slow. No matter the size of my cheesecake, it bakes at 275 deg F for the required time and then I turn the oven off and let it sit for the required time without opening the door of the oven. Roughly an hour of baking and then 30-40 minutes in the cooling oven. The slow bake is what keeps it from drying out and 'raising' to a puffy state and the slow cool is what keeps it from cracking. Such a perfect yellow-y and moist cake wreath! Love how you write about it! Ha! I love this post. I totally agree. Those damn Pinterest photos always make crafts look so easy! At least your pound cake is beautiful as always! I am in Bend. Do I need to make any changes because of the altitude? omg what a disaster I created. Was this recipe suitable for high altitude (5400 ft) or should I have made an adjustment? I also used cake flour, would that make a difference? So bummed, I was so excited to make this for an easter treat. Yes; this recipe is meant for sea-level! Oh no!!! Sorry to hear that, but this recipe is only for sea-level. I moved to Portland 3 years ago and this is no longer a high altitude baking blog. Baffled by step 6. Just can't picture it. Can anyone explain it a different way ... I guess my brain just doesn't work this way. They sound delicious, fast and easy. You're basically folding each trip in half to trap all the sugar in; hope that clarifies things! How could I convert this recipe to a Lemon Cheesecake? Oh gosh, I made this cake to take to a cookout this weekend. I know it's not exactly seasonal for spring, but I saw this on your blog and thought it looked AMAZING! It was easy to make and looks so gorgeous! I am in love with your blog, Michelle!